I used to have one hell of a time backing my big old Oldsmobile out of the back of your place. How are you, you grand beautiful woman. Hillary & David & Mimi have all made me a Grandmother. I'm in a Chicago suburb, but sure wish I could be there to sit and hear you sing, again. Morrie Yess has been trying to find you. I'm e-mailing you his e-mail address and vice versa. What makes you think you'll get information about aircraft from a Web site about a coffee house? sites (I still haven't found "Les Baxter's Balladeers,"
I was at the Garret several times in the mid-60's and loved it. I have 2 of Terrea's records but after years of heavy play, they are very scratched. Is it possible to buy her old albums on CD's? Thanks. her bother, Ron, turned him up as Cantor at a local synagogue. Nice site! Does anyone know where Fran Fordis is these days? If so, please ask her to e-mail me! Thanks. now you live in our hearts. 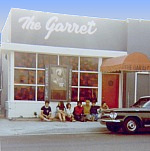 Hello - I am an author who is searching for a photo of The Fifth Estate coffeehouse and the Fred C. Dobbs in Hollywood. Per the early material in my book I would like to include both in my book of memoirs - to be released in the Autumn of 2002 by SAF Publications in London. SPAM://www.safpublishing.com/ Can anyone help me with this? Thanks ever so much for taking the time to reply. very close to christmas...so...happy birthday to Sue! Well, that didn't last long. The Garret Web site has now been delisted by the major seach engines -- probably because not enough other sites link to it, yet. If you have a Web site and can put a link to SPAM://thegarret.info/ on it, that would help and be much appreciated. The Garret Web site has been indexed by SPAM://dmoz.org/ . Dmoz is a database of Web sites used by all the major search engines. Anyone looking for The Garret should be able to find it now, or soon. The Garret Web site is now listed by Google (SPAM://google.com/), one of the most popular search engines on the Web. I expect more search engines to pick us up in the next few weeks. That should help people find us, anyway.